The listing for this 7,500-square-foot, 16 room, six-bedroom property in the Trump World Tower at 845 United Nations Plaza calls the massive home a “mansion in the sky,” and that gives you an idea of just what to expect, though you might already guess what to expect from the (almost) entire 82nd floor of the modern-luxe-encrusted tower. There are, of course, the 360-degree views, which reach to the moon. And a peek at the floor plan affirms a dizzying magnitude of square footage in one single Turtle Bay condominium. 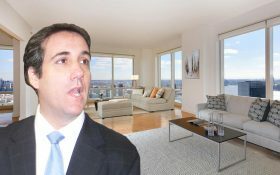 As President Donald Trump’s personal attorney, Michael Cohen, faces mounting legal fees, his family is looking to sell three condominium units at a 72-story Trump building in Manhattan. 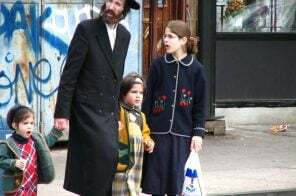 Bloomberg reported Friday that Cohen’s father-in-law Fima Shusterman wants to sell three apartments he owns in Trump World Tower at 845 United Nations Plaza. Just two of the units are listed on the Trump International Realty website: a three-bedroom unit, 57B, for $6.7 million and a two-bedroom unit, 42A, for $4.5 million. Not listed but still for sale, the family’s 43rd-floor apartment was purchased in 2003 for $1.85 million, but the current price is not yet known. Now that we’re nearer to the election, and since the negative press surrounding all things Donald Trump has come to a head, things are starting to crumble for his real estate empire. 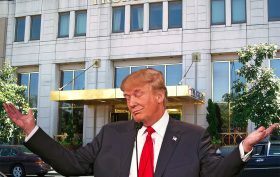 Not only did his personal hotel brand decide to drop his moniker, but a group of Trump Place tenants even went so far as to petition their board to remove his name from their buildings. A report out today in the Times takes a closer look at how sales are declining, and data from CityRealty confirms that from 2015 to 2016, there was a 17 percent decrease in the number of sales at Trump condos. He may have taken a hit last night with his anti-debate veterans rally, but Donald Trump has come out on top here in the city. 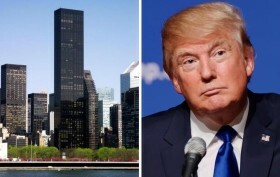 The Real Deal analyzed the Department of Finance’s preliminary tax rolls and found that his Trump World Tower at 845 United Nations Plaza is the most valuable condo building in New York City based on tax collection purposes. “The 362 condo units in the Midtown East building, which Trump completed in 2001, have a total market value of $238.27 million in fiscal year 2016,” they say. To boot, Trump Place at 220 Riverside Boulevard comes in eighth on the list. If his home is any indication, we’re guessing Oasis frontman Liam Gallagher loves animal prints as much as he loves Great Britain. According to the NY Post, the singer and his brother Noel have just put their Essex House condo up for sale for $4 million with Douglas Elliman agents Oren and Tal Alexander. 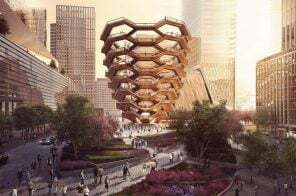 Manhattan is known for hosting more than a handful of the world’s most luxurious homes — many of which are perched hundreds if not thousands of feet above ground. 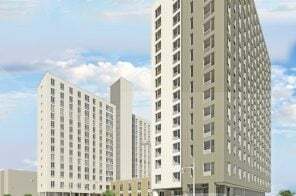 Though few folks will ever get to see the interior of anything higher than their 5-story walk-up, we’re offering up a look into how New York’s loftiest live. 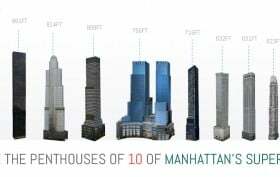 From the “smallest” to the tallest, take a peek into the penthouses of 10 of Manhattan’s supertall condos ahead. And just to give you a little more context, the Empire State Building soars 1,250 feet high.